Over 2 million children today have some type of sleep disorder. An estimated 30 to 40 % of children do not get enough sleep. Sleep Apnea has also been linked to many other problems in children such as SIDS, ADD, ADHA, Autism, Obesity, Narcolepsy, Insomnia, Cardiovascular, etc. Over 18 million American suffer from sleep apnea and sleep disorders. Estimated 10 million are still undiagnosed today. This has been linked to deaths in adults as well as children and infants. If you are concerned about Sleep Apnea symptoms you have noticed in your child, talk to a doctor immediately. The symptoms you notice may be normal in children, but ignoring a Sleep Apnea related condition can have serious side effects. Apnea includes a temporary cessation of breathing, where breathing stops and begins again automatically after a few seconds, as well as a prolonged pause, where the baby must be resuscitated. Apnea usually occurs during sleep and is primarily a disorder of premature infants. Babies born before 34 weeks of gestation do not have a fully developed central nervous system, and they often do not have adequate control of the breathing reflex. The more premature a baby is, the greater the likelihood of apnea. Episodes of apnea are also more problematic for smaller than for larger babies. A small baby stores a smaller amount of oxygen, so the effects of oxygen deprivation are more severe. Apnea usually appears within the first several days after the baby is born. Premature babies are usually kept in an incubator, where their breathing and heart rate are monitored. A drop in the baby's heart rate will sound an alarm, and a nurse can stimulate the baby to resume breathing, if necessary. If apnea is diagnosed, it will probably recur, but most premature babies outgrow the condition by the time they reach their normal due date. Mild apnea causes no ill effects. The breathing pause is short (10-15 seconds), and the baby starts breathing again on his or her own. In a severe episode, though, breathing may cease for 20 seconds or longer. The infant begins to turn blue because of the lack of oxygen in the blood. The baby retains carbon dioxide and may lapse into unconsciousness unless stimulated to breathe. Rubbing the infant with a finger or striking the soles of the feet may be all that is needed to end a short episode of apnea. If the baby has become unconscious, however, he or she may need to be revived with an oxygen mask. If apnea is frequent or severe, the baby's doctor may decide to treat it by altering conditions in the incubator, such as lowering the temperature, increasing oxygen, or placing the infant in a rocking incubator. Blood transfusions and medication may also be necessary. Premature babies are also at higher risk for "late apnea," which occurs when the infant is older than six weeks. Late apnea can also affect full-term babies and may be a sign of an underlying problem such as congenital heart disease, infection, anemia, meningitis, or seizures. The baby usually recovers from apnea as the underlying disease is treated. Even if no underlying cause is found, late apnea is usually outgrown by the time the baby turns one year old. There are no specific measures to prevent apnea. It seems to be a sign of developmental immaturity, and it sub-sides as the baby grows older. Usually a premature baby in an incubator is continually monitored, and hospital staff can easily detect apnea. 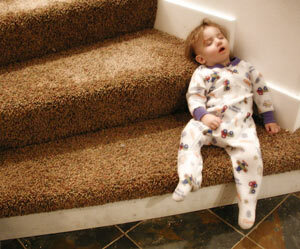 With late apnea, parents may not notice that the child has stopped breathing in his sleep. If apnea is suspected or diagnosed, parents may install a home monitor until the condition is outgrown. Undiagnosed late apnea can be fatal, and is associated with sudden infant death syndrome (SIDS). Parents of premature babies need to be apprised of the possibility of apnea, and should be instructed on how to resuscitate their infant if it occurs. Those particularly worried about late apnea may also wish to be trained in infant first aid. Since apnea usually occurs during sleep, parents may decide to sleep near the baby. When babies sleep, unexplained lapses in breathing known as apnea lead to a diminished oxygen supply to the brain and heart and can cause Sudden Infant Death Syndrome (SIDS). This tragic syndrome is the leading cause of death among infants ages 1 month to 1-year-old. Although research has made progress, SIDS remains capricious. Current recommendations to reduce the risk of SIDS for your infant include putting babies under the age of one to sleep on his or her back. If SIDS can be avoided, infants experiencing sleep apnea usually grow and develop normally. Most children are believed to be out of danger of SIDS between 6 months and 1-year-old, but the peak for sleep apnea in children is age 2-5 years. Snoring is one symptom of sleep apnea in infants and worth mentioning to your pediatrician. 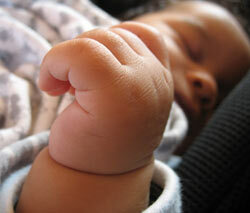 If a baby snores, it could by asymptom of obstructive sleep apnea. 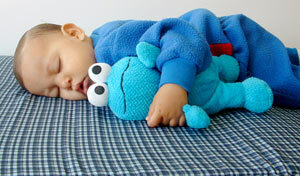 This means that your baby experiences a prolonged partial blocking, or sporadic breathing while they sleep. The cause of this irregular breathing is often caused by enlarged tonsils or adenoids. Babies with sleep apnea don't get sound sleep, and their intake of oxygen is below an optimal level. The negative effect on a child's intellect and behavior is often misdiagnosed as a behavioral disorder like ADHD. If you think your infant may have sleep apnea or is at risk for SIDS, respiration monitors designed for use with infants are available. This specialized instrument senses minute chest movements brought about by breathing. If your baby stops breathing for 20 seconds or her respiration drops below 8 breaths in a minute, an alarm is riggered. This monitor not only records chest movements but also checks heart rate. Your health care provider will be happy to show you how to use the monitor. As an additional precaution, it is a good idea to receive training in CPR for infants. Using a nasal CPAP at night. This device delivers air through the airway with a specially designed mask. After your infant has had a complete medical evaluation, if no cause can be found for apneaï¿½this is usually called Apnea of Infancy. On the bright side, sleep problems resulting from this condition usually go away on their own, and Apnea of Infancy is actually considered part of a normal breathing pattern. If you think your baby has sleep apnea, be sure to talk to your doctor about it because most apnea cases are treatable or managed with monitoring devices, medication or surgery if they don't go way on their own. What is sleep apnea and how do I know if my child has it? Sleep apnea is a common problem that affects an estimated 2% of all children, including many who are undiagnosed. If not treated, sleep apnea can lead to a variety of problems. These include heart, behavior, learning, and growth problems. If you notice any of these symptoms, let your pediatrician know as soon as possible. Your pediatrician may recommend a sleep studyï¿½ usually an overnight study called a polysomnogram. Overnight polysomnograms are conducted at hospitals and major medical centers. During the study, doctors and medical staff will watch your child sleep. Several sensors will be attached to your child to monitor breathing, oxygenation, and brain waves electroencephalogram (EEG). Many children with sleep apnea have larger than normal tonsils and adenoids. The most common way to treat sleep apnea is to remove your child's tonsils and adenoid. This surgery is called a tonsillectomy and adenoidectomy. It is highly effective in treating sleep apnea. Obstructive Sleep Apnea is the most common form of Sleep Apnea and occurs when the muscles and tissues in the throat and air passage relax while sleeping, and this impedes the flow of air into the lungs due to a blockage of the airway. This can occur many times per hour in the sleep cycle and especially during the REM sleep stages. In REM sleep all of the muscles and in fact the entire Musculo-skeletal system goes into an extremely relaxed state that causes the tongue, soft palate, tonsils, from the nose to the glottis, and the oropharynx to completely loosen up and this creates the obstruction or impedance to the air flow, thereby causing apnea (complete stoppage) and hypopnea (partial stoppage) events, as well as snoring events. Oxygen Saturation in the blood levels drop significantly and usually this is followed by constant neurological mechanisms or arousals with each event that may not wake the person entirely from sleep but disrupt sleep constantly enough to cause many issues. A person with Obstructive Sleep Apnea rarely gets into the REM sleep stages or restorative cycle (Slow Wave Cycle) long enough or at all and the long term effects can be quite serious and numerous. Central Sleep Apnea is caused by the part of the brain that controls respiratory function and these centers in the brain are imbalanced and do not respond or react quickly enough to changes in oxygen or carbon dioxide levels in the blood stream. Essentially, the brain does not respond at all to the normal triggers that would cause a person to breathe or take a breath. Pure CSA is fairly rare or uncommon. But basically the person just stops breathing for a period of time, and this can occur even when awake. A type of Central Sleep Apnea known as "Cheyne-Stokes respiration" occurs primarily in people with kidney disease, stroke, or congestive heart failure. Drops in oxygen levels (hypoxia) can cause seizures or in rare cases even death. The exact cause of Central Sleep Apnea is usually unknown and it is often partly treated with medications. Over 60 million Americans suffer from one of more than 80 different sleep disorders. These sleeping disorders can have a profound effect on everything from driving a vehicle, to work and school performance, to relationships with family and coworkers.